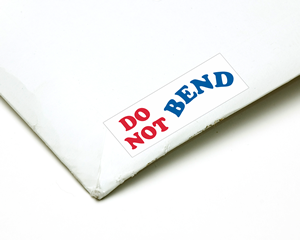 Do Not Bend Labels are ideal for mails containing postcards, stamps, books, banknotes or photographs. Use these labels to call attention to your fragile or other flat shipment. Help the carrier understand that any twisting or bending can cause damage to the contents. Sometimes, the strongest of packages will not fully protect your special freight. Labels give the carriers a "heads-up". • Do Not Bend Labels are bold and readable from afar. • Labels come in a roll of 500 units. You can separately order a label dispenser to manage the roll easily. • Supplied by strong acrylic adhesive backing, the label adheres to corrugated boxes, envelopes, etc. When you have a fragile box, be sure to use Do Not Stack labels so no one loads one on top of the other.